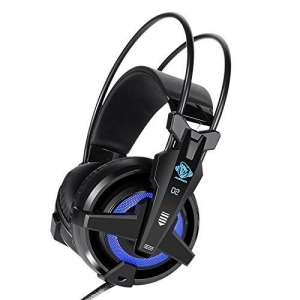 The E-Blue Auroza EH5950 gaming headset dhas a 7.1 surround sound that immersive 4D FPS gaming experience. It has a smart vibration with ice blue glowing effect. The headset is light weight without pressure; skin-soft leather ear cups that ensure supreme comfort. The ice blue lighting effect system has an awesome pulsing glow effect that syncs perfectly with your game steps. Without the mic being in front of your face, it is invisible. Also, there is a remote control so you can control your volume, mute, glow and vibration effects right at your fingertips. headband and the microphone Awesome pulsing glow effect syncs perfectly with your in-game steps!